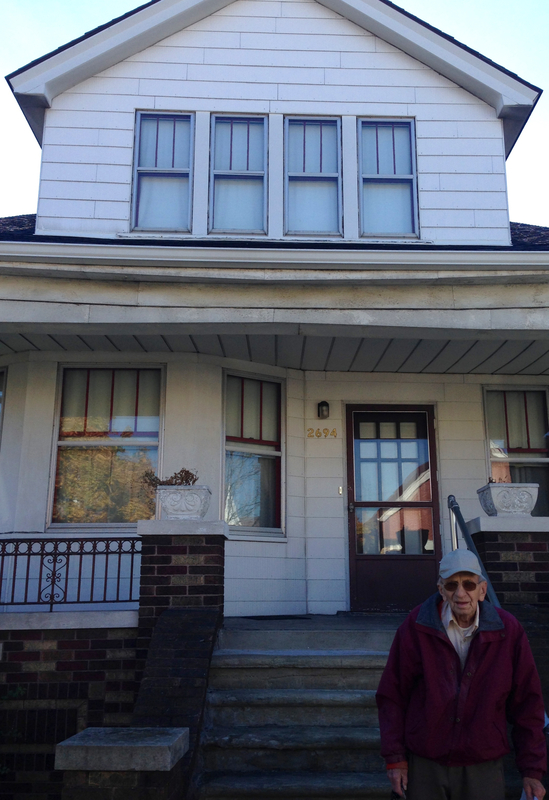 Last fall, I met a man in front of his home in Hamtramck. His told me that his name was Mr. Ben Jaros, that he was 97 years old and had lived each of those years in this very house (except for the ones when he was enlisted in World War II). I snapped a photo in front of the house with the intention of sending it to him one day and taking him out to coffee or breakfast or polish food and soaking up his stories. I knew he had many to share and our brief encounter gave me the impression that he just might like to tell them. My intent was sincere but non-urgent and life is busy. I planned to get to it the next time I printed photos, but over a year passed and I never got around to it. Finally, I got the photo printed and a week or too after that I bought a frame. It sat in the passenger seat of my car for another while until I finally made the time to visit. I wanted to leave a large open window of time just in case the a spontaneous impromptu interview should await me. I knocked but no one was home, more time passed until I found a moment for another visit. Now, Mr. Ben Jaros didn’t need me and my little 4×6 photo to validate his life. He didn’t need to know that he was among my mental cast of characters in this city or that, however unrushed I seemed to be, I sincerely wanted to take him out to a greasy breakfast and let him talk to his heart’s content. His 98-year life was just fine without me. So why do I feel so bad? I think it’s because I know I had the chance to do something that would have almost invariably enriched both of our lives and I never got around to it, not in time at least. This is not the first time I’ve procrastinated in the face of death. When my grandmother was very sick, I made a CD of classical music for her. I filled it with beautiful peaceful songs that I hoped would trigger fond memories of her life and ease the difficulty of not being able to speak any longer. One week after I mailed it, package showed up in my mailbox with the label “return to sender” stamped on it by from the hospice care– she had already passed before she had the chance to listen to it. She had been sick for years but I didn’t begin my project until the end was imminent. As a resident of the city of Detroit, I am a great admirer of Grace Lee Boggs. I enjoyed the power of knowing that my time in this city (and on this earth) overlapped with hers. I quote her and read her and attend events in her name. I know her to be approachable and generous with her time. She died a few months ago at the age of 100 and I never made an effort to meet her in person. Every day, there are a thousand more things to do than I manage to fit in. There are stories to write and friends to visit and papers to organize and emails to reply to and crafts to make. There are dozens of living authors, teachers, activists and acquaintances who have actually changed my life but may never know it because I may never take the time to tell them so. The same is true of life itself. I will never “catch up” with all the things I could or should or would like to do. If there is a formula for the drive to keep on living, I believe it is merely the discrepancy between goals and accomplishments (If done is greater than > undone THEN Will to Live). But nothing is inevitable. The fact that a discrepancy exists does not mean that my life will necessarily continue. There are plenty of people whose wishes outlive their lives. I know that the fulfillment of everything on my To-Do list is not a prerequisite to the end of my life. I also know that I haven’t learned this lesson for the last time, but I have learned it enough to have it make an impression on me, at least for now. I’m grateful for the reminder to do just a few more of the things that seem unimportant because they are small, but are pressing because they won’t be available forever. The dog that the polish woman was walking looked just like 13-year-old Tansy, my family’s dog, who is lying in a kennel at the vet’s office right now, waiting or not waiting to spend her last christmas with the family who loves her. If I mentally extend myself to any given person in my life, there is more that I could do to acknowledge or appreciate or give the gift of sincere attention to. I can never do it all, but I can do more. On this solstice, this shortest day of the year, I am reminded of the brevity that coincides with all the abundance of life. I am reminded to do just a few of the things I always mean to do and be grateful for the time I have. This entry was posted in Hamtramck, Non-Fiction, Personal Narrative, Place and tagged death, solstice, time. Bookmark the permalink.